December 15, 2016, 11:12 AM · Violist Carol Rodland will join the viola faculty of The Juilliard School, beginning fall 2017. Rodland, an alumna of Juilliard, is currently professor of viola at the Eastman School of Music in Rochester, as well as an artist-faculty member at the Perlman Music Program, the Bowdoin International Music Festival, and the Karen Tuttle Coordination Workshop. Carol Rodland. Photo by J. Adam Fenster. 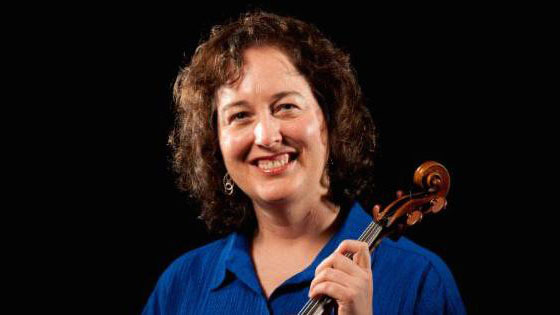 Previous positions have included professorships at the Eastman School of Music, where she was also co-chair of the string department, at New England Conservatory, where she was recognized in 2005 with the Louis and Adrienne Krasner Award for Excellence in Teaching, at Berlin's Hanns Eisler Hochschule, and at Arizona State University. Recent guest teaching residencies have included master classes in the United Kingdom at the Royal College of Music in London, in Germany at the Hochschule für Musik und Theater in Saarbrücken and at the Universität der Kunste in Berlin, in Norway at the Valdres Sommersymfoni, in Tel Aviv Israel with the Perlman Music Program, and in the United States at The Juilliard School, Oberlin Conservatory, Boston Conservatory, New England Conservatory, Indiana University, University of Michigan, and the Walnut Hill School. Rodland also is the founder and artistic director of If Music Be the Food, a benefit concert series created in 2009 to increase awareness and support for the hungry through the sharing of music. The concerts are volunteer efforts, with musicians donating their services, venues donating the performance spaces, and audience members bringing food or cash donations for the local food bank as the price of admission. The series also aims to teach music students about the importance of using their art for service in their communities. Rodland made her solo debut with the Philadelphia Orchestra as a teenager and subsequently won first prizes at the Washington International Competition, the Artists International Auditions, and the Juilliard Concerto Competition, as well as the Universal Editions Prize at the Lionel Tertis International Viola Competition. She has also been the recipient of Fulbright and Beebe Fund Grants and Juilliard's Lillian Fuchs Prize. Rodland earned both her bachelor and master of music degrees from The Juilliard School, where she studied on full scholarship with Karen Tuttle, as well as an Aufbaustudium Diplom awarded with distinction from the Musikhochschule Freiburg, where she studied with Kim Kashkashian. She served as teaching assistant to both Tuttle and Kashkashian. December 16, 2016 at 07:07 AM · Congratulations, Carol! We met in NYC through Nancy, and I've thought of you so often! I'm in Phoenix now so if you ever find yourself passing through or working here, I'd soooo want to know! All best to you, and may our paths cross again...wouldn't that be fun!